We developed this perfect tool to help you solve the dull blades,you will work in the kitchen more convenient and more easier. 2 wheel sharpening system that creates a double bevelled edge on your knife.This type of edge is not only super sharp but also creates the edge on your blade,the sharpness stays longer, much longer. There is no need for cumbersome grinding,the blade will be sharp after a few seconds. The first wheel is coarse grinding,tungsten steel sharpening system,has a high strength grinding force,suitable for blunt blade and daily grinding,and will not harm to the blade.The blade will be more sharper and the double edge will last more longer. The design of the handle is both artistic and comfort.Firmly metal stainless steel base,the bottom is equipped with anti-skid pad added stability and control,it will give you a solid sense of security. The stainless steel material brings extraordinary enjoyment. This one is only suitable for grinding metal kitchen knives,fruit knives,bone cutting knives,boning knives,etc.,and It is not suitable for grinding scissors,ceramic knives and serrated knives. 2.Hold the anti-skid handle in one hand,the other hand holds the knife. 3.Place the end of the knife into the sharpening slot,make the blade stays perpendicular to the table and will not swing from side to side. Hold the knife by the handle and pull it along the sharpener slot toward you about 5 times.One direction gently pull back. The Knife Sharpener will meet your daily needs,you can create more possibilities about food in your hands. If you are not satisfied with your blendnew purchase,you can contact to us,we will glad to give you a full refund. How about try it now? 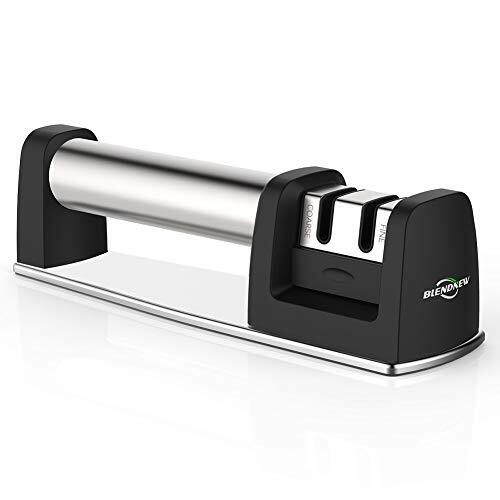 THE FIRST CHOICE OF PROFESSIONAL CHEFS: The most difficult part of cooking is preparing food,but dull knife increases the difficulty of cooking.If you are still annoying for the sharpness of the knife,our blendnew Knife Sharpener will be the best tool for you.This perfect knife sharpener will keep any straight edge steel knives constantly sharp. It's a nice tool to have for you in the kitchen. MORE SAFER,MORE EFFICIENT,MORE CONVENIENT: Our sharpener is multifunctional,with its special 2-stage sharpening system,you can solve the problem of sharpening quickly.Coarse grinding of tungsten steel and fine grinding of ceramic rod.There is no need for cumbersome grinding,the blade will be sharp after a few seconds.Our sharpener is very simple and easy to use,safe and convenient. ATTRACTIVE,DURABLE,ENVIRONMENTALLY FRIENDLY AND HEALTHY: Soft touch grip handle is ergonomic,the design of the handle is both artistic and comfort.Firmly metal stainless steel base,the bottom is equipped with anti-skid pad added stability and control,it will give you a solid sense of security.Every detail is perfect.Place your dull blade into the sharpening slot and pull out for a razor-sharp blade in seconds,you will get a sharp knife like a new one. SAVE YOUR MONEY: With the product,you can sharpen all your dull knives and bring them back to their full glory.Dull knives will be a thing of the past.You will not need to spend a small fortune on a new set.This product is only suitable for grinding metal kitchen knives,fruit knives,bone cutting knives,boning knives,etc.,and It is not suitable for grinding scissors,ceramic knives and serrated knives. 100% SATISFACTION GUARANTEE OR YOUR MONEY BACK: If you are not satisfied with your BLENDNEW purchase,you can contact us,we will glad to give you a full refund.If you have more questions,you can email us and we will reply to you as soon as possible in 24 hours. If you have any questions about this product by BLENDNEW, contact us by completing and submitting the form below. If you are looking for a specif part number, please include it with your message.